Volunteers got their hands dirty in the mulch at the North Carolina Coastal Federation’s two rain garden maintenance days at Alderman Elementary School on Oct. 25 and Bradley Creek Elementary School on Nov. 1. At Alderman Elementary, three volunteers came to help maintain the rain garden. Volunteers included Blair Bannon, a former federation intern, and two employees from the South Wilmington Orangetheory Fitness. Third-grade students at the school also helped the group spread mulch. Kate Conery, AmeriCorps member for the federation, and Mackenzie Todd, federation intern, led stormwater runoff education programs with the third-graders. Jessica Gray, coastal outreach associate for the federation, said the group even found a bird’s nest in one of the bushes, and intern Dustin Walsh took turns helping the kids get a better view of the nest. Volunteers from Orangetheory Fitness joined in for the workdays. They are pictured here at the Bradley Creek Elementary workday. At the Bradley Creek event, seven volunteers joined the federation for the event. 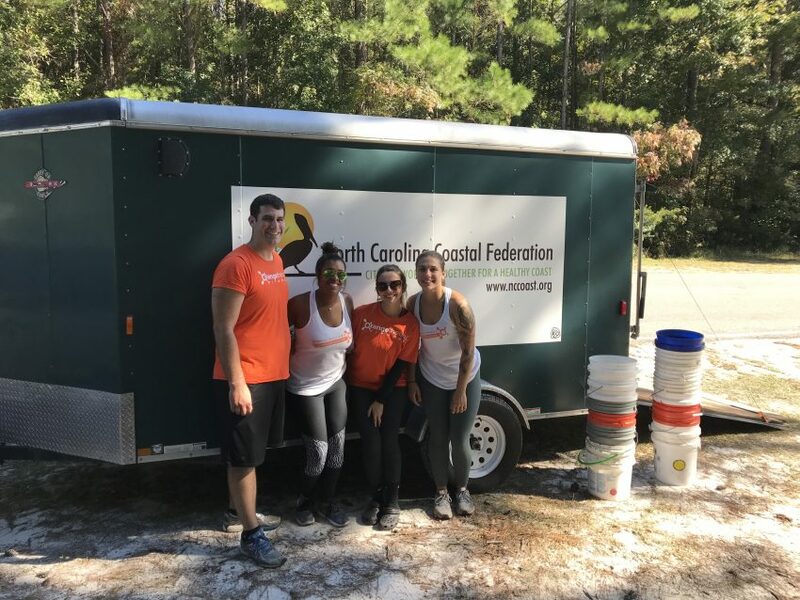 Volunteers included more employees from Orangetheory Fitness, as well as Frank Headly and Katie Jansen, two regular federation volunteers. Beach Bagels sponsored the Bradley Creek Elementary event by bringing bagels, house-made cream cheese and fresh coffee. They also helped out with maintenance work. Gray said she loves doing work at the Bradley Creek rain garden because she attended the school.